The remodeled Mid Century home at 1652 Comstock Ave., LA CA 90024 lasted 93 (+181) days on the market before receiving an accpted offer on 9/15/09. The property was originally listed for $2,450,000 back on 10/23/09. That listing period lasted 181 days, ending 4/22/09, and recieved 3 price reductions down to $1,995,000. 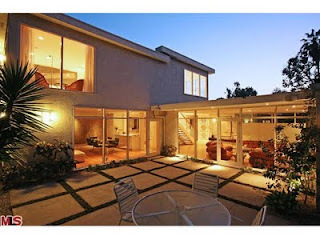 The property was then relisted on 6/12/09 for $2,195,000. Just 1 price reduction, down to $1,995,000 resulted in the accepted offer. The home sold on 10/27/09 for $1,870,000. This home is completely move-in with very nice modern finishes throughout. The remodel job looks to have been done with quality and attention to detail. According to the MLS, the home is a 3 bedroom / 3 bath, 2,540 sq ft home on a 6,185 sq ft lot.